:: Information about Cape Verde, Ecology, Demographic Information, Government and Economy Information and Facts. Area: 4,033 sq. km, or 1,557 sq. miles. (1.25x Rhode Island; 1.5 x Luxembourg; 7 x Singapore; 4 x Hong Kong). Continental Shelf: 10,450 sq. km. 200 Miles Exclusive Economic Zone (EEZ): 734,265 sq. km. Location: West African archipelago of 10 islands and 8 islets, divided into two groups: Northern Windward ("Barlavento"): Boa Vista, Sal, Santo Antao, S. Vicente, Sao Nicolau, and Santa Luzia; Southern Leeward ("Sotavento"): Brava, Fogo, Maio, Santiago. Situated off the southern Mid-Atlantic Ocean Ridge. 630 kilometers (375 miles) west of Gambia, Senegal, and Mauritania. Circa 1350 miles east of Brazil; 2750 miles SW of Britain; 3400 miles SE of New York; 1450 south of Azores. Latitude: between 14 degrees 48 minutes and 17 deg. 12 min. North (same latitude at Martinique in West Indies). Longitute: between 22 deg. 41 min., and 25 degrees. 22 min. West. Language: The official language is Portuguese, the local inhabitants however speak their own Creole. French and English are also understood by an appreciable section of the population. Time Zones: -2 hours Greenwich Meridian time. Passport: Visas, Customs: To enter the country all visitors (except those from the ECOWAS and Portugal), must have a passport and visa issued by the Cabo Verde Consul in the country of origin (for VISA requirement go to the main menu or click on Visa). Organized excursion groups do not require a visa if the visit is communicated beforehand to a local travel Agency. Health: Special precautions: The AIDS prevalence rate is 0.8%. Cape Verde's population is among the healthiest in Africa. Climate: Average daily high temperatures range from 25 °C (77 °F) in January to 29 °C (84.2 °F) in September. Geographic data: Lying in the middle of the Atlantic between two continents, more or less between the parallels 15 and 17 latitude North, the archipelago of Cabo Verde, a closely knit group of 10 islands and 8 islets, located about 500 km from the African promontory that gave its name. 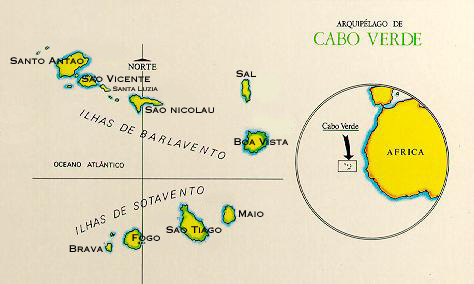 In relation to the trade winds, Cabo Verde is divided into two parts, leeward, including the island of Santo Antao, s. Vicente, Santa Luzia, S. Nicolau, Sal and Boa Vista and Windward including Santiago, Maio, Fogo and Brava. With a total area of 4,033 km2, it is one of the five Atlantic archipelagos of the so called Macaronesia, the others being Azores, Madeira, the Salvage Isles and the Canary Islands. The archipelago is volcanic in origin and basically there are two types of islands, those that are quite flat and surrounded by extended beaches of fine sand - Boa Vista, Maio, Sal, and those that are more mountainous and rocky with number of quite spectacular valleys running between them. Each of the islands has a different geophysical identity, offering to the Caboverdean landscape the permanent seduction of the unexpected. Climate : The climate in Cape Verde is mild to tropical dry, with two seasons: the dry season, between November and July, during which the trade winds strongly blow; The humid season (rainy season) from August to October, with the islands being reached by air masses of intertropical convergence that result in irregular rain falls. The medium average temperature is around 24 C, the thermic amplitudes do not go over 10 C because of the ocean influence. The temperature of water oscillate between 21 C (February/March) and 25 C (September/October). In the summer (July to October) it is the season of water during which the islands are covered by a green carpet. The "brume" atmospheric dust brought by the Saharan winds, blows from January to March is appreciated by those who sail and surf. History: Although there is no real proof, there are indications that the Romans and the Carthaginians were aware of the existence of the archipelago, and also that at a later date, in the XII century, Arab seafarers reached the Cabo Verde islands. What is exact and based on written documents, is that the Portuguese marines who landed there between 1460 and 1462 found no sign of life. In view of its strategic position however, in the routes that linked it to Europe, Africa, Asia and Brazil, the archipelago soon became a center of concentration for men, and animal and plant life. The archipelago has experienced recurrent drought and famine since the end of the 18th century, and with the decline of the slave trade. The island position astride mid-Atlantic shipping lanes made Cape Verde an ideal location for resupplying ships. Because of its excellent harbor, Mindelo (s. Vicente) became an important commercial center during the 19th century. In 1956, Amilcar Cabral organized in Guinnea-Bissau, the clandestine African Party for the Independence of Guinea-Bissau and Cape Verde (PAIGC).The PAIGC began an armed rebellion against Portugal in 1961. Following the April 1974 revolution in Portugal, the PAIGC and Portugal signed an agreement providing for a transitional government. In July 5, 1975 the country became independent. How to get there: Airline travel is the best choice. In Sal there is an international airport and flights from the West coast of Africa have an airport in Praia at their disposal. The main airlines providing regular international service are TACV. TAP, SAA, AIR SENEGAL, Aeroflot, TAAG. The local airline, TACV, guarantees the inter-islands flights. Alternatively, there are facilities for yachts at any one of the islands. Clothing: The average temperature are around 25 C, never getting below 10 C, therefore light clothing can be wore at any time of the year. Domestic animals, plants, weapons and temporary import of vehicles are subject to local legislation. All movement related to pleasure boat is controlled by the port captain. Currency / Exchange: The local currency is the Cabo Verde escudo. There are $50, 1$00, 2$00, 10$00, 20$00, 50$00 and 100$00 coin, and 100$00, 200$00, 500$00, 1,000$00 and 2,500$00 notes. Currency exchange can be done at any of the banks or hotels. Credit cards are not accepted by the majority of places. However some of the bigger hotels do accept the most well known international cards. Handicraft: The handicraft in Cabo Verde is most well known for tapestries of S. Vicente, followed by the articles made from sea shells and coconut shells. Music: The music from Cabo Verde is very melodious, but also rather melancholic, perhaps the "Morna" being the most well known internationally. The combination of European music with the African and Brazilian rhythms produces others forms of expression, such as the "Coladeira" and the "Funana". A number of Cabo Verde groups, around them CESARIA EVORA, are well known internationally. Food and drink: The most well known local dish is "cachupa" which is made from ground maize, beans and sometimes meat or chicken. Lobster and other shell-fish are abundant, so too is the wonderfully fresh fish. The local beer is excellent to accompany the tropical fruit and the sweets, and to finish off, a cup of the excellent Fogo coffee.